Since bringing our Contributing Writers on board last year, I’ve been amazed at the great content they’ve contributed here. And also amazed at the way readers have engaged with that content. Now I’ve got another treat in store for you. My friend and colleague, Judith Briles (The Book Shepherd) is joining The Book Designer as a Contributing Writer. Judith has an amazing background in book publishing. She’s the author of over 30 books, both traditionally published and self-published. 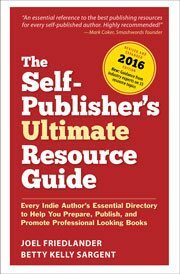 She is a frequent guest on television and has helped hundreds of authors through her publishing group, AuthorU. I was honored to be a presenter at a recent AuthorU event in Denver, Colorado. Judith’s energy and enthusiasm for publishing, along with her prodigious organizational talents made it one of the best publishing events I’ve ever been to. I can’t wait to see what she has in store for readers. But we won’t have to wait long, because her first post will go live tomorrow. Stay tuned and help me welcome her to The Book Designer.